The answer came when astronomers used a combination of the NSF's Very Long Baseline Array (VLBA), the Karl G. Jansky Very Large Array (VLA), and the Robert C. Byrd Green Bank Telescope (GBT) and discovered that a region of radio emission from the merger had moved, and the motion was so fast that only a jet could explain its speed. "We measured an apparent motion that is four times faster than light. That illusion, called superluminal motion, results when the jet is pointed nearly toward Earth and the material in the jet is moving close to the speed of light," said Kunal Mooley, of the National Radio Astronomy Observatory (NRAO) and Caltech. The astronomers observed the object 75 days after the merger, then again 230 days after. "Based on our analysis, this jet most likely is very narrow, at most 5 degrees wide, and was pointed only 20 degrees away from the Earth's direction," said Adam Deller, of the Swinburne University of Technology and formerly of the NRAO. "But to match our observations, the material in the jet also has to be blasting outwards at over 97 percent of the speed of light." he added. The scenario that emerged is that the initial merger of the two superdense neutron stars caused an explosion that propelled a spherical shell of debris outward. The neutron stars collapsed into a black hole whose powerful gravity began pulling material toward it. That material formed a rapidly-spinning disk that generated a pair of jets moving outward from its poles. As the event unfolded, the question became whether the jets would break out of the shell of debris from the original explosion. Data from observations indicated that a jet had interacted with the debris, forming a broad "cocoon" of material expanding outward. Such a cocoon would expand more slowly than a jet. 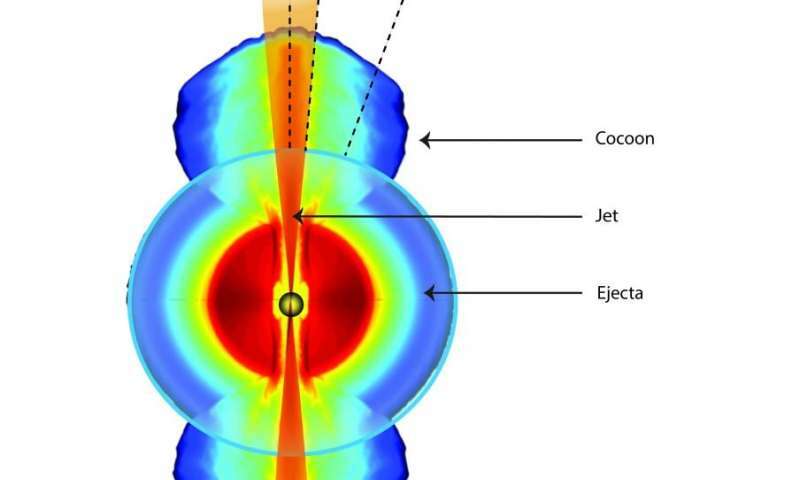 "Our interpretation is that the cocoon dominated the radio emission until about 60 days after the merger, and at later times the emission was jet dominated," said Ore Gottlieb, of the Tel Aviv University, a leading theorist on the study. "We were lucky to be able to observe this event, because if the jet had been pointed much farther away from Earth, the radio emission would have been too faint for us to detect," said Gregg Hallinan of Caltech. 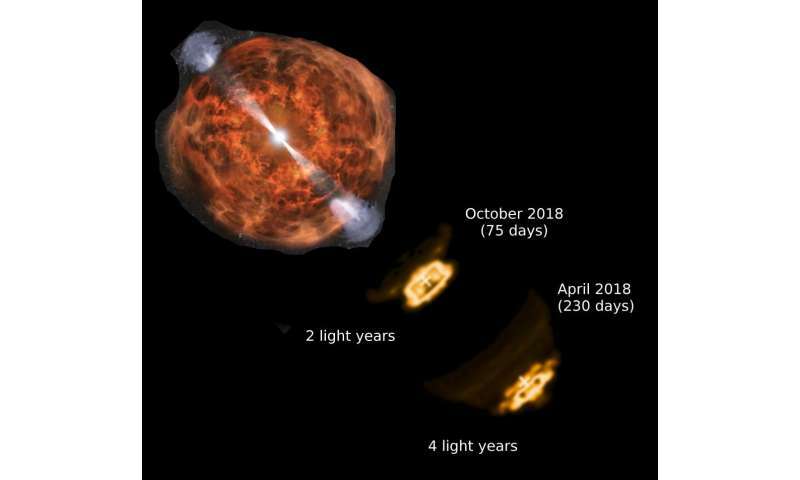 The detection of a fast-moving jet in GW170817 greatly strengthens the connection between neutron star mergers and short-duration gamma-ray bursts, the scientists said. They added that the jets need to be pointed relatively closely toward the Earth for the gamma ray burst to be detected. "Our study demonstrates that combining observations from the VLBA, the VLA and the GBT is a powerful means of studying the jets and physics associated with gravitational wave events," Mooley said. "The merger event was important for a number of reasons, and it continues to surprise astronomers with more information," said Joe Pesce, NSF Program Director for NRAO. "Jets are enigmatic phenomena seen in a number of environments, and now these exquisite observations in the radio part of the electromagnetic spectrum are providing fascinating insight into them, helping us understand how they work." Mooley and his colleagues reported their findings in the September 5 online version of the journal Nature. Perhaps someday in the not too distant future, a space optical telescope, equipped with Radio, IR, X-ray, etc. instruments will be sent off to somewhere beyond the Oort Cloud or in the spaces between the Stars, so that Radio and all other emissions may be detected even if not pointed directly at, or away from the vicinity of Earth.It will take many years also of traveling to get there, (eg. Voyager1 and 2) but it will be worth the wait to have such a "warning signal" available, just in case. I'm not sure you are aware how big space is (or how photons - or even geometry - work). And if the telescope were 1 ly away, how much warning would we get? Well, given that the radio signal from the telescope will take 1 yr to reach us, it will get here at the same time as the GRB. Seems a bit pointless. Here is a good exercise for you SEU. The jet was 5 degrees wide and pointed 20 degrees from earth, just detectable. Considering the distance to the source of the jet is 40 megaparsecs how far do you have to send a telescope from earth to see jet itself? Calling the Surveillance_Egg_Unit, come in Surveillance_Egg_Unit. Still on it's way to the jet. It's further than the Egg thought. The authors of this report about source recession speed of radio and x-ray waves along the 3-D space direction of decelerating expansion C4 of Riemann 4-radius R4 may want to study the papers and books of Suntola Dynamic Universe (DU) - and find the presented postulates lacking as 'proofs of NS merger'. A more difficult task remains to connect assumed BH or NS mergers with the Nobel awarded 'GW detections' of LIGO stations after the 2015 artificial increase of resolution to detect affine scale changes in two local perpendicular space directions of the interferometric tubes. The side-band circulation by factor of 75-284 to 'prove Einstein right' is even a bigger mistake than Dark Energy confirmation using SNa1 data - the achieved strain level -1.15 10^-21/ms is a magic joke by Nature to fool GR believers about the constancy of C. It is the decay of ticking rate of atomic clocks (and other processes) at the same rate as the decelerating TRUE VARIABLE value of C=C4, see Suntola DU books. How wide a cone these two stars are emitting this radiation that it encompasses the earth has Déjà vu about it. As I've already said: "Perhaps someday in the not too distant future, a space optical telescope, equipped with Radio, IR, X-ray, etc. instruments will be sent off to somewhere beyond the Oort Cloud or in the spaces between the Stars, so that Radio and all other emissions may be detected even if not pointed directly at, or away from the vicinity of Earth.It will take many years also of traveling to get there, (eg. Voyager1 and 2) but it will be worth the wait to have such a "warning signal". Obviously, certain commenters here completely ignored my example of Voyager1 and 2 and the enormous distances they have traveled out to beyond the Oort Cloud and into interstellar space. So below is my example. In a further testament to the robustness of Voyager 1, the Voyager team completed a successful test of the spacecraft's trajectory correction maneuver (TCM) thrusters on November 28, 2017. The last time these backup thrusters were fired up was in November 1980. ]" It appears that Voyager1 crossed into Interstellar Space on 25 August 2012, after a journey of only ~35 Earth years. Therefore, a new optical space telescope carrying several peripheral instruments could follow the same path as Voyager1 and possibly travel even faster with a new propulsion power plant. Yes SEU, you have already said that. Now, again, how far away was the jet? And, as mentioned in another thread, Voyager has gotten nowhere near Oort cloud distances. Oort cloud = 50 000 - 200 000 AU. Voyager currently = ~ 140 AU. The superluminal motion or perspective illusion requires understanding of photogrammetric principles in addition to the dynamic geometry of decelerating expansion of universe. In the fashion of 1998 SN1a interpretation of DE/DM densities of the mistaken cosmological constant there are major differences in the APPARENT and TRUE values of the cosmic distances of R4, optical distance of 130M l.y (R4 difference between the emittal and receiver times), expansion speed C4 OF space and C IN space and their present DU deceleration rate (-35.5 km/s per Mpc). The main factor and error source for GR interpretations of speeds and distances comes from the DU based 'dynamic' time concept T4 proportional to the inverse of 3rd power of true value of C=C4. This complex issue has already fooled GR based Nobel 'confirmations' of DE and GW - and there are 5-10 other 'GR/QM mistaken postulates' waiting to fool the old cosmology school.